The BMW Kl was the solution to a serious problem that faced Europe's largest motorcycle manufacturer in the late 1980s. Although well-established the product line-up was looking increasingly tired and dated. Their range of K100, K75 and flat-twin touring roadsters enjoyed a solid reputation for quality engineering and reliability. However, the market was experiencing unprecedented demand for large capacity sports bikes. In comparison to the sports flagships of the Japanese, BMW's bikes appeared tame and a touch staid. The company needed a new pure sports motorcycle. 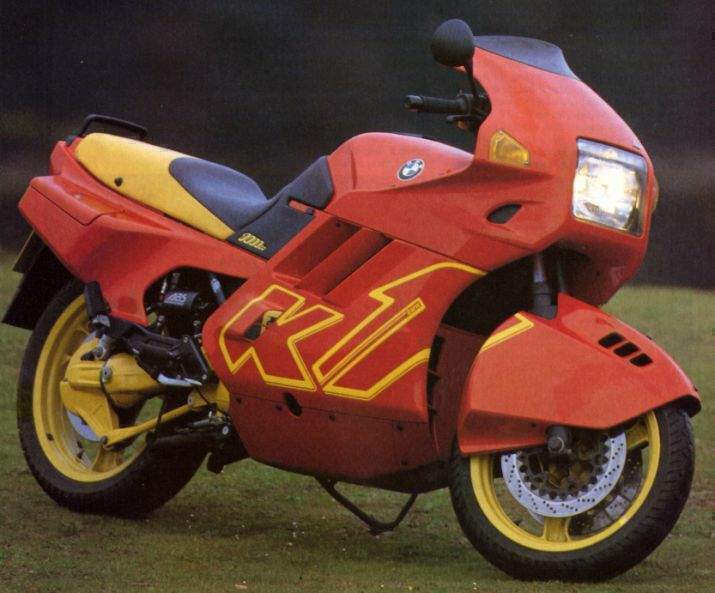 In 1989, they unveiled the Kl, and what a striking, sensational-looking motorcycle it was. Designed to attract big sports bike enthusiasts and to keep BMW alive in the fiercest of markets, the Kl has succeeded on all fronts largely because it is so different. The bike's distinctive bodywork, including the virtually-enclosed front wheel and bulbous tail section, is designed to make it aerodynamically efficient. Viewed head on, the bike presents a huge frontal area but this tapers away to the rear tail hump and gives an impressive drag coefficient of .38, a figure better than any other currently produced motorcycle. Its slippery shape helps it maintain a fop speed in comfort for the rider, who is well-protected from the wind-rush. BMW needed an aerodynamic advantage because, in Germany motorcycle horsepower output is limited to a maximum of l00bhp.